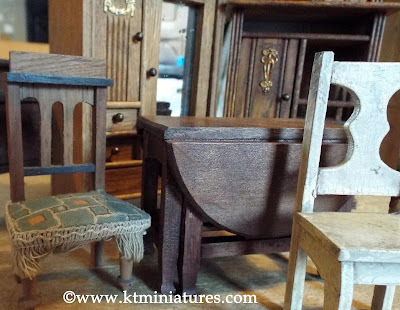 Bertha Penrose Furniture & A Little More Besides - See You On Saturday! 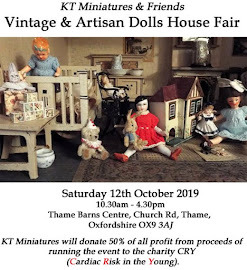 Am still in the middle of sifting through all the wonderful antique and vintage stock in readiness for this Saturdays Thame Dolls House & Miniatures Fair. 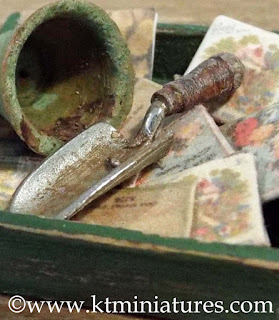 Before packing away I have been endeavouring to photograph one or two of the more special items. The very top of the list just has to be some utterly exquisite Bertha Penrose dolls house furniture, she was an accomplished artist and sculptor. I am calling it Bertha Penrose, but in fact Penrose was Bertha's first husbands name...and what a wonderful artistic family it was - on the fringes of the Bloomsbury Set. But more about that another day. 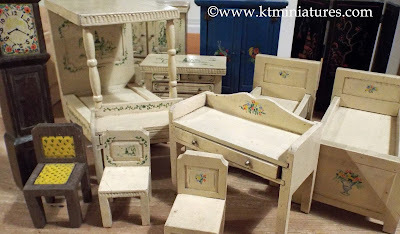 With her second husband Ralph White, she made this furniture for her children in her studio - I am assuming that all the exquisite painting was undertaken by Bertha as I found her signature (BW) on one of the pieces. Perhaps Ralph did some of the constructing? 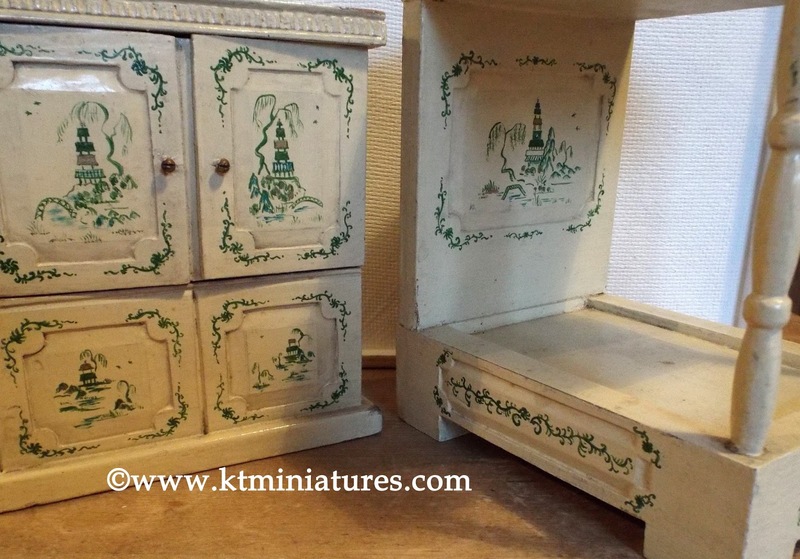 Some, such as this German display cupboard with antique backing paper, German dresser and Japanese inlaid hallstand, all originate from the 1920s and 1930s. 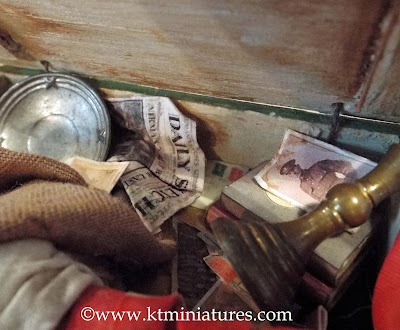 Whereas the red tinged tin dressing table with swivel oval mirror, is probably from the late 1800s to early 1900s. 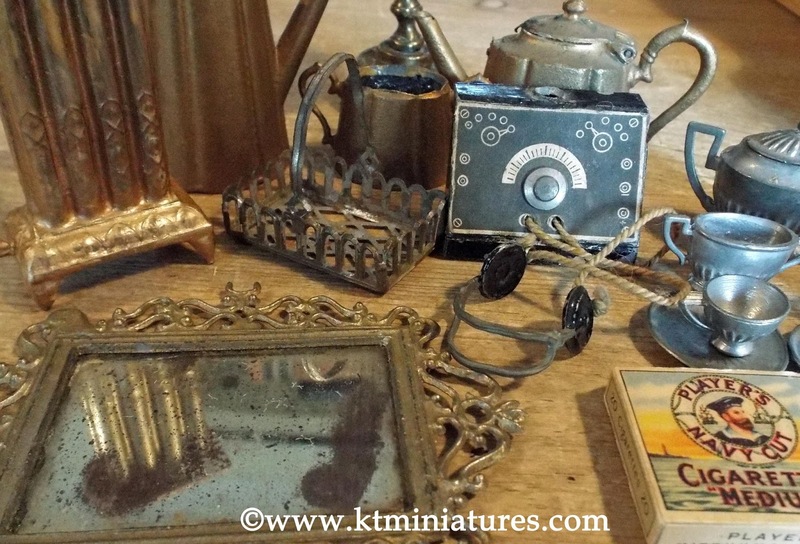 There will also be some tiny accessories, including this late 1800s/early 1900s ornate German mirror, a 1920s crystal German wireless and early 1900s German radiator. 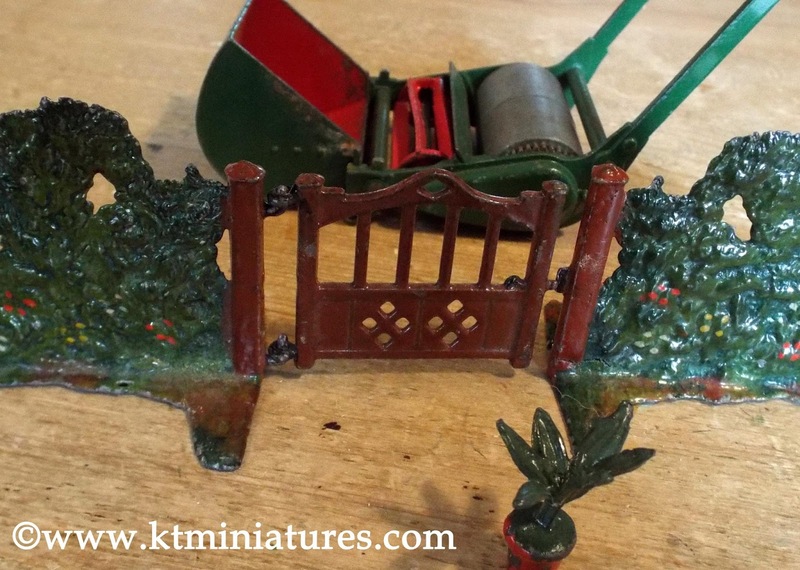 Amongst some of the pieces for the antique and vintage garden is this c1930s Britains lead garden gate/hedge set, this wonderful large scale Dinky lawnmower complete with grassbox (this is so often missing) and this gorgeous rare c1930s T&B lead plant! 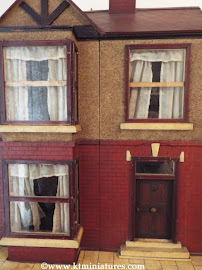 I will be taking just one dolls house this time, as there is just not enough room for any more...this tiny c1930s dolls house. 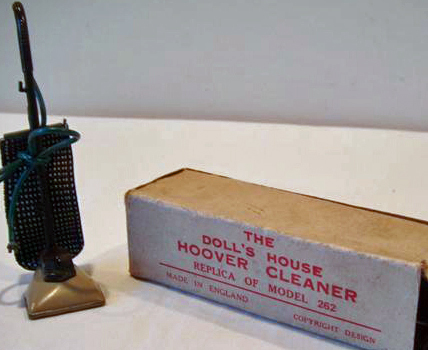 It is quite a curious thing and I am wondering whether it is a H.R & L Dennis dolls house? 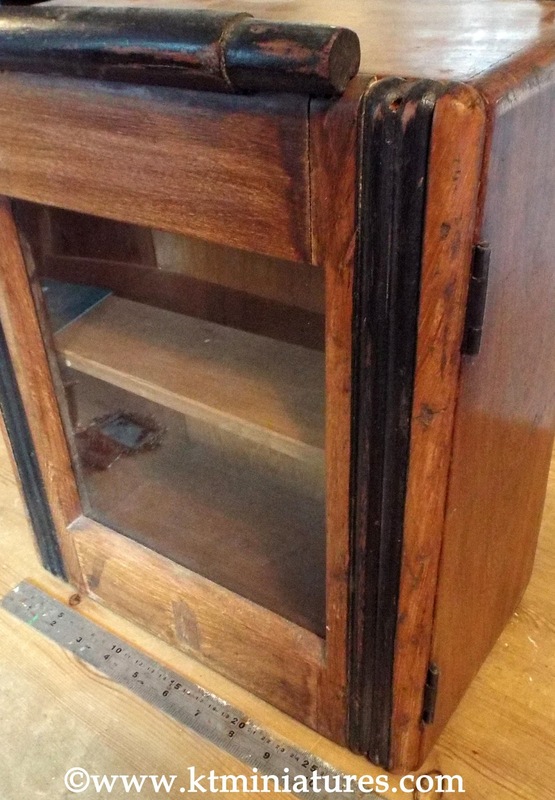 And finally.....from my own private collection, I will be taking this lovely c1920s/30s Art Deco Display Cabinet. 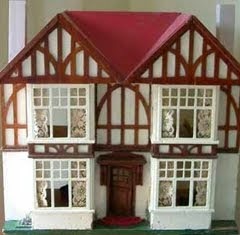 Is fantastic for displaying your old dolls house miniatures. I simply no longer have room for it. Available to purchase on Saturday will be this LET'S GO CAMPING SCENE, made by my workshop colleague Robin and myself, as a "how to make" feature last year for Dolls House & Miniature Scene Magazine. 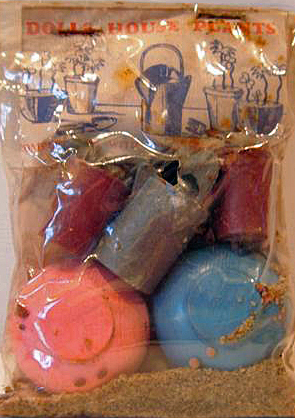 It is now surplus to requirements and must go. We are happy to take offers. 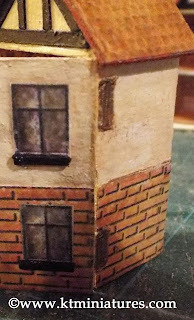 Plus this 1/12th scale prototype of an early 1900s German style shop (our Nostalgia In Miniature 2016 Workswhop Project) will be on display on the far end of my stand. Robin's Coombe Crafts stand will be right next door, so if you have any queries with regards to our workshops, one or other of us should be on hand for a chat. We do have a few spaces remaining for our summer workshops, and we will have booking forms with us if necessary. Well thats about it folks..... hope you can come to the Thame event at Thame Leisure Centre (Oxfordshire) on Saturday. The venue is close to the M40 and a short bus/taxi ride from Haddenham & Thame Parkway Station. There will be 45 stand holders, many being high quality artisans, fundraising attractions as usual for BREAST CANCER NOW charity, plus an exhibition of work from the local miniaturist club. My stand is No.30, in the usual place by the double exit doors in the Main Hall. If you are coming, please do drop by my stand and say "hi". It would be lovely to meet you. Labels: Art Deco Display Cabinet For Miniatures, Bertha Penrose Antique Dolls House Furniture, H.R & L Dennis Dolls House, Thame Dolls House & Miniatures Fair 2016. 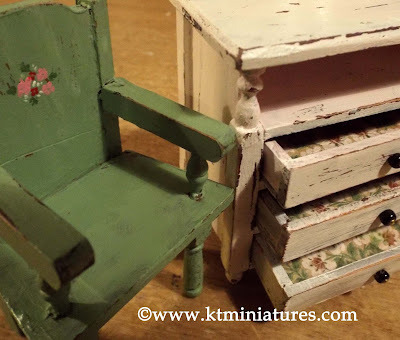 Thame Dolls House & Miniatures Fair is taking place this coming Saturday, so I have just been putting the finishing touches to the last few handmade bits and bobs that are about to leave my workbench. 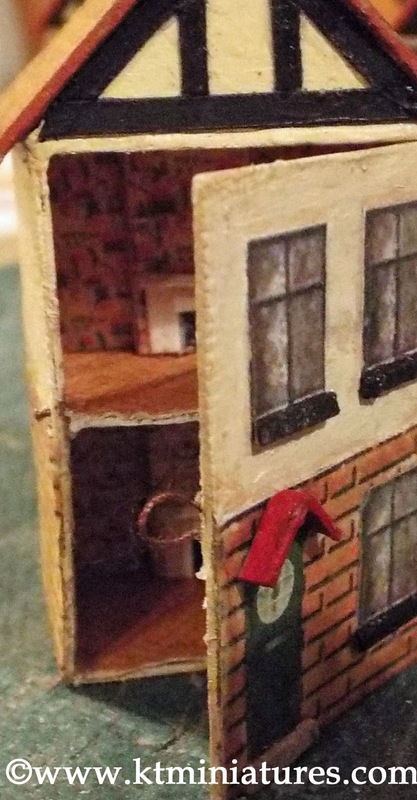 For your old dolls house nursery there are some old fashioned antique style toy bricks, some lithograph antique style elephants standing on old childrens books, plus some of KT Miniatures usual sets of old style books fixed together in batches. 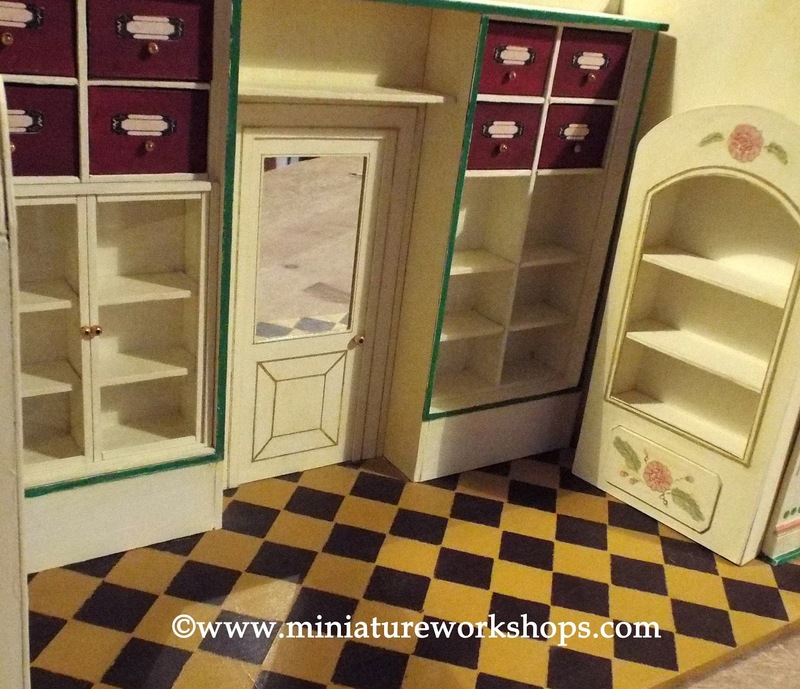 On the same theme, I have also been making various vintage toy shelves, with a wonderful c1920s backing paper. 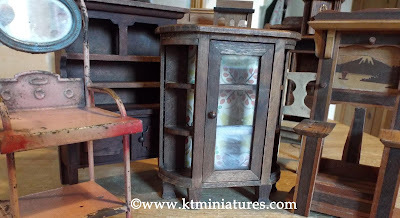 I have just not had time to photograph every single one of my recent creations as there is now quite a collection, but my Thame Fair Stock Page is now live, so if you are coming on Saturday, you can see at your leisure a comprehensive list of both handmade plus antique/vintage items that I will be taking. Although please note, that all items will be sold on a first come, first serve basis and cannot be reserved before the fair. Also I will not have credit card facilities on the day-sorry, so you will need to pay in cash or from well known customers only, I would be happy to accept cheques. I will be adding to the list further during the week, mostly to the antique and vintage section - and if I have room on my stand, will have one or two popular "rummaging boxes" too. 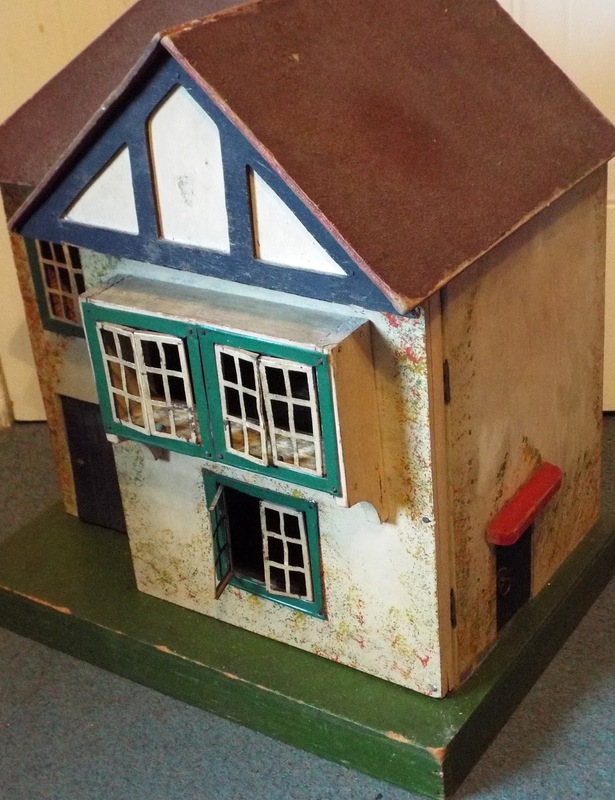 In a day or so, I hope to feature some photos of a selection of antique and vintage pieces that will be available to purchase on Saturday, including a delightful little c1930s dolls house. Daughter Kate is dashing back from uni for the weekend and has been bribed offered to help me on the day, so if you are coming on Saturday, do please stop by our stand and say "hi". It would be so nice to meet you all. Followers of KT Miniatures Journal may remember a few weeks back the story of these DCA items above, that have been donated by the son of one of the co-founders of the company DCA (CLICK HERE). Well, these items have arrived and will be for sale on my stand, with all proceeds in aid of the charity - Breast Cancer Now. Again, these will be sold on a first come, first serve basis and I hope that whoever purchases these wonderful rare miniatures will give generously. Continuing on from last week's blog posting...here are some more KT Miniatures mini creations on the workbench, in preparation for the Thame Dolls House & Miniatures Fair in just over 2 weeks time. As you can see, work is very much still in progress. Based on a basic vintage dolls house design, I have created these to look old, circa 1920s/1930s. Am quite pleased with the prototype...just another five more to make! 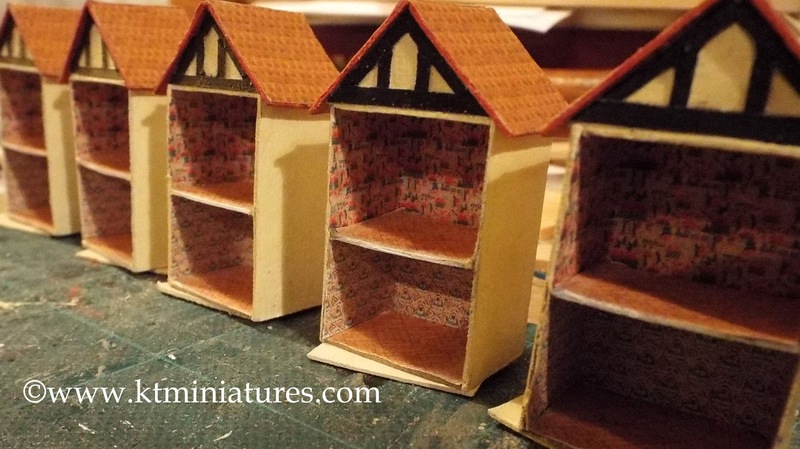 Labels: Miniature Dolls Houses For Dolls House, Vintage Miniature Dolls Houses. More Creations - Vintage Style! Now that I am back at my workbench, the creating is well and truly in full swing. 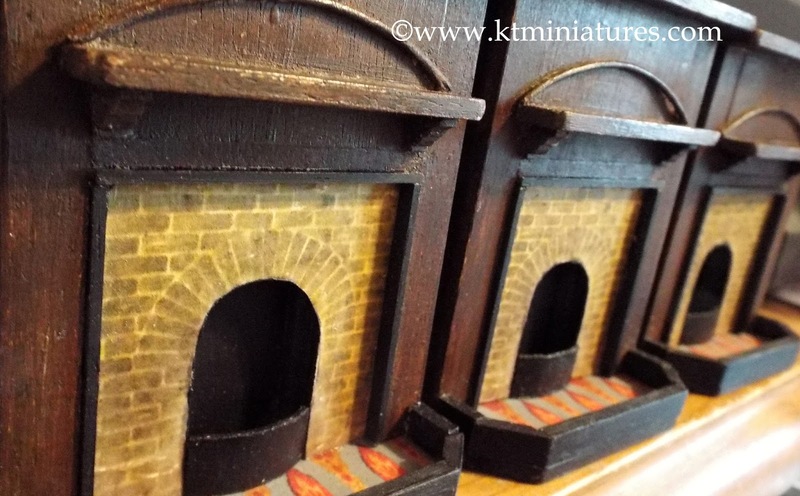 The latest to leave my workroom and packed up ready for the forthcoming Thame Dolls House & Miniatures Fair are these replica miniature German c1910 fireplaces. They are based on my own antique German fireplace that resides in my old Hobbies 186 Special dolls house (can be seen halfway down the right hand column of this blog)....they have been great fun to make! 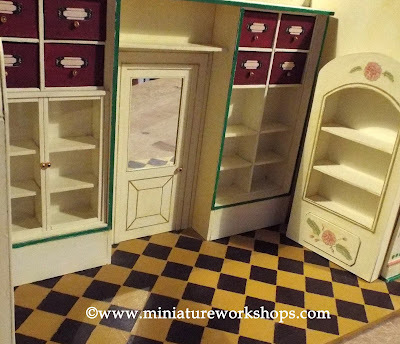 For the dolls house kitchen, I have been creating continental inspired dolls house shelf units and open shelves, some with vintage style background imagery. Very soon, a "Thame Fair Stock Page" will appear on the website with a comprehensive list of all my handmade plus antique/vintage stock that will be available at the Thame event. 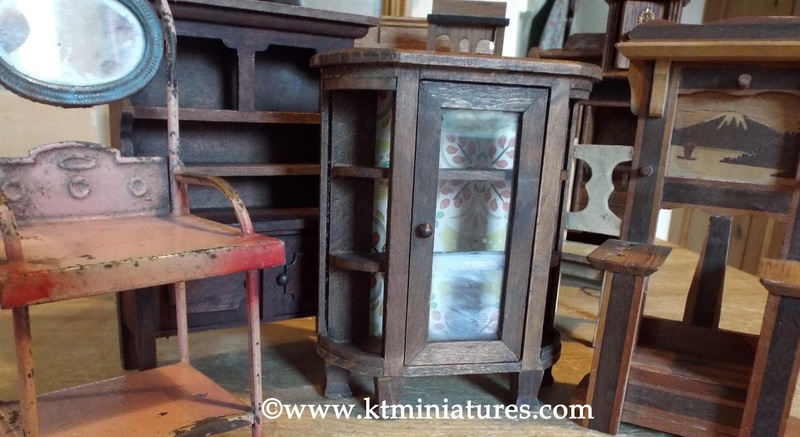 Labels: Antique Handmade Early 1900s German Style Dolls House Fireplaces, Continental Dolls House Vintage Style Kitchen Shelves, Thame Dolls House Fair 2016. 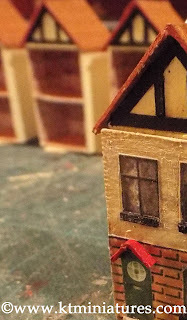 At Last...A Little Bit Of Creating For Thame Dolls House Fair! 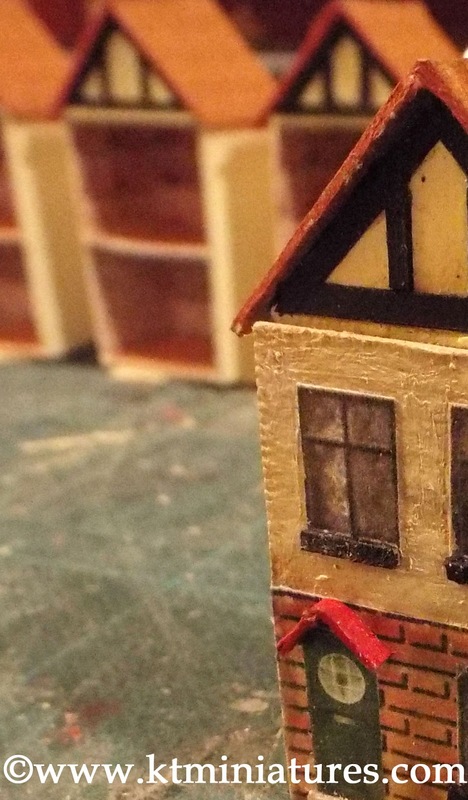 There are just over 3 weeks to go before the wonderful Thame Dolls House & Miniatures Fair takes place on Saturday 27th February. 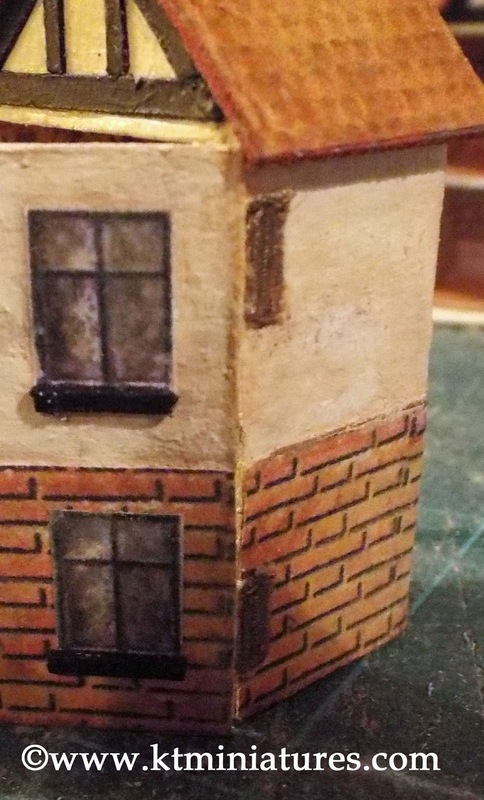 And am delighted to say that at long last, after a considerable absence, I have been able to get to my workbench and embark on some proper creating. 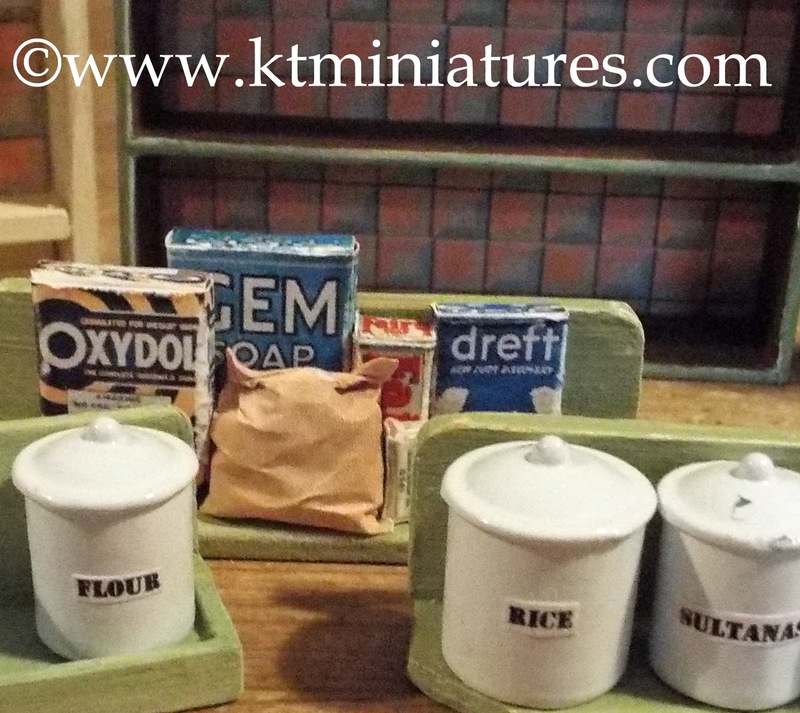 Some vintage c1920s/1930s "seconds" have been given the KT Miniatures treatment and brought back to life. One or two random vintage odds and ends have been tucked amongst the handmade contents of this heavily aged wooden trunk. 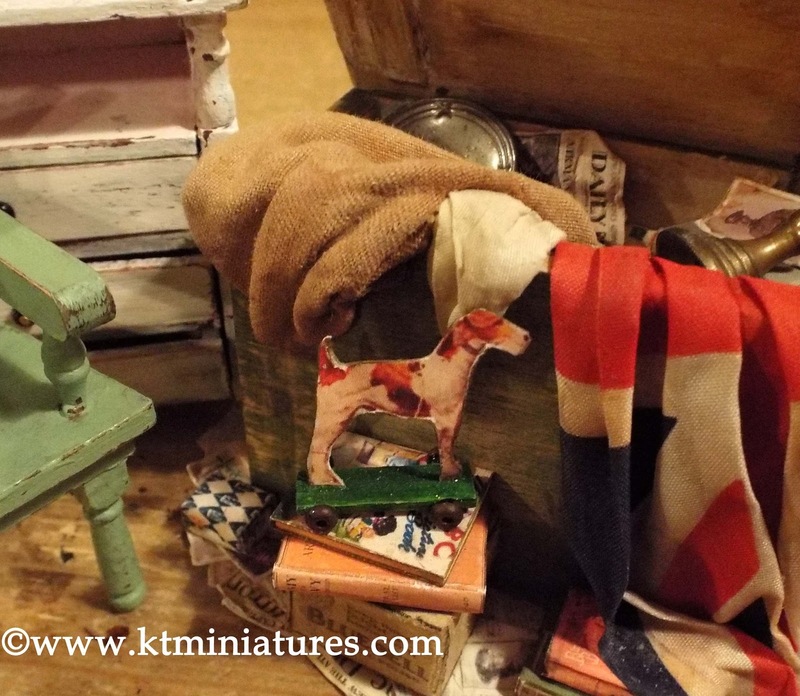 As always, a Thame Fair Stock Page will appear on the website a few days before the event, consisting of both my handmade miniatures as well as antique/vintage pieces that will be available to purchase on the day. 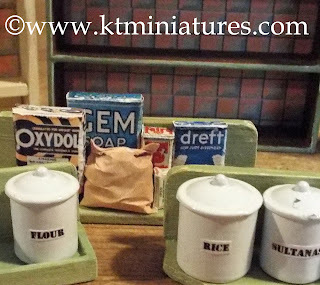 All KT Miniatures handmade items are suitable for use in both vintage and modern reproduction dolls houses. Meanwhile, I will continue to list a few antique and vintage pieces up to the website over the next week or so, then no more stock will be listed until after the Thame event. 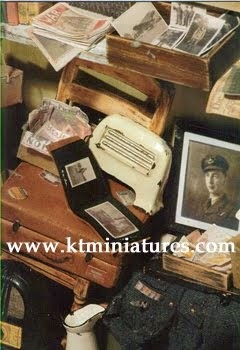 Unsold stock will be listed to KT Miniatures website after the Thame event has ended.